Is Holo in cinta with Laurence atau is she just playng him? pilihan fans: Yes, She's crazy for him. Yes, She&# 39; s crazy for him. No, She&# 39; s playing him. Do anda want a Spice & serigala Season 3? what animal do anda think of when anda see Holo? 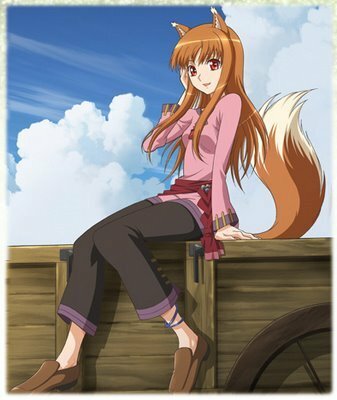 Will there be a season 3 to Spice and Wolf? In Season 3, should Lawrence marry Holo atau should they say farewell? pilihan fans: Gets married, have kids, lives as long as Holo, and epic win!!!!!! Can anda link me atau post this image? Holo and I were just hanging out in the north, and she said, "What do anda want to do, Hoshi?" "Hmm..we could go to the cities?" She smiled, shrugged and said, "Why not?" When we go up to the cities and stuff, [ugh sorry] we usually go to see if we can find some apples and just to toko around, try to find some lebih clothes for when we go up there in half human form. a comment was made to the poll: what animal do anda think of when anda see Holo? a pop quiz question telah ditambahkan: Which Baltic nation is the Spice and serigala setting inspired by? How many years has Horo lived?